FOR ONE NIGHT ONLY - The Australian Supercross Championships round 3 heads to WIN Stadium Saturday 9th November presented by Yamaha. See Australia’s best take on riders from overseas in bar to bar racing. A full size Supercross Track will be built giving race fans the opportunity to see riders go big on the purpose built supercross track. 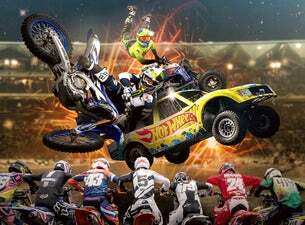 The event will include the most popular Triple Crown Format will see riders in SX1 & SX2 compete in three 3 race finals to determine the event champion. A full line up of support races, guests and additional features will be announced closer to the event.